Text: King Henry the 8th, This Play, by Order of Sir William Davenant, was all new Cloath’d in proper Habits: The King’s was new, all the Lords, the Cardinals, the Bishops, the Doctors, Proctors, Lawyers, Tip-staves, new Scenes: The part of the King was so right and justly done by Mr. Betterton, he being Instructed in it by Sir William, who had it from Old Mr. Lowen, that had his Instructions from Mr. Shakespear himself, that I dare and will aver, none can, or will come near him in this Age, in the performance of that part: Mr. Harris‘s performance of Cardinal Wolsey, was little Inferior to that, he doing it with such just State, Port and Mein, that I dare affirm, none hitherto has Equall’d him: The Duke of Buckingham by Mr. Smith; Norfolk, by Mr. Nokes; Suffolk, by Mr. Lilliston; Cardinal Campeius and Cramnur, by Mr. Medburn; Bishop Gardiner, by Mr. Underhill; Earl of Surry, by Mr. Young; Lord Sands by Mr. Price; Mrs. Betterton, Queen Catherine: Every part by the great Care of Sir William, being exactly perform’d; t being all new Cloath’d and new Scenes; it continu’d Acting 15 Days together with general Applause. Comments: John Downes (?-1719) was an author and theatre prompter at the Duke’s Theatre, the United Company and Thomas Betterton‘s King’s Company. He wrote a history of the English stage 1660-1706, Roscius Anglicanus, a mixture of notes, anecdotes and cast lists which is a major source of information on the Restoration theatre. The production of Henry VIII at Lincoln’s Inn Fields Theatre, London, was presumably adapted by William Davenant, the supposed illegitimate son of William Shakespeare and certainly a major advocate and adapter of Shakespeare’s works. He was manager of the Lincoln’s Inn Fields Theatre. John Lowin was an actor for Shakespeare in the King’s Men. 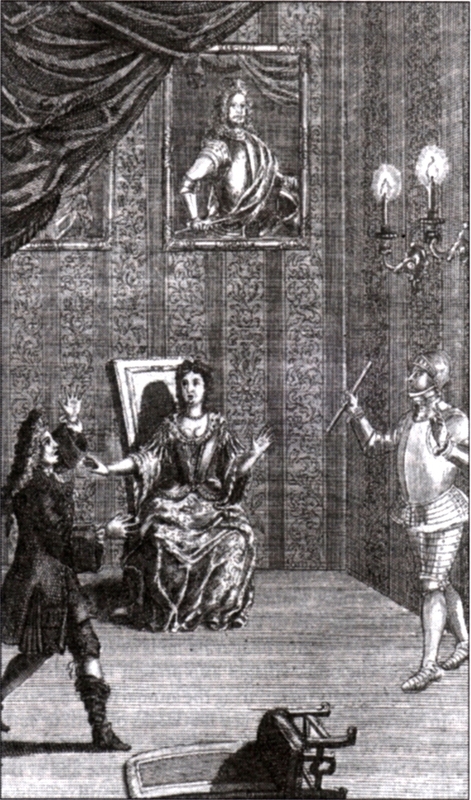 Thomas Betterton (1635-1710) was the leading actor of the Restoration period. Among the other actors named are Mary Saunderson (Mrs Betterton), Henry Harris, William Smith and James Nokes. The production opened on 22 December 1663.